12 of the best vinyl test records | What Hi-Fi? Some records are of more use than others when it comes to finding out just how good your turntable-based system can sound. And, obviously, some records come with better songs on them than others. Here we've compiled a list of albums that, to us, manage the by-no-means common feat of ticking both boxes. 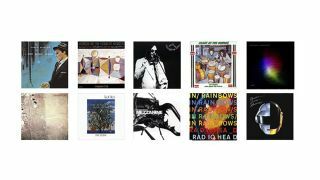 We've no doubt you've got your favourites, but these dozen albums have proved invaluable in the What Hi-Fi? test rooms. A failed suicide attempt, a divorce and the messy end of his most significant extra-marital affair brought Frank Sinatra to the point where only a magnificently unhappy album about loneliness, failure, isolation and depression would do. It’s possible that this is where the ‘concept album’ originated. Lushly arranged by Nelson Riddle, In the Wee Small Hours has the sort of vocal eloquence and immediacy that can make the hair on your head stand to attention. Never has one man’s loneliness and vanishing sense of self-worth sounded so compelling or so lavish, or so at odds with the vivid orchestration from which it cries. You’re not short of choice where Charles Mingus records are concerned. Between 1950 and 1960, he released at least 23 albums. But it’s Mingus Ah Um – packed with compositions written for or about Mingus’s musical heroes, such as Lester Young and Duke Ellington, as well as less affectionate figures, such as Orval E. Faubus – that is the most consistently dazzling. Those who know will tell you Mingus Ah Um is a post-bop jazz record, but all the rest of us need to know is that it’s elegantly played by virtuosos and recorded by people who care. The swing and syncopation so crucial to jazz is preserved verbatim, and where the most evocative details are concerned - the sound of a sax-player’s breath as it escapes the mouthpiece of his instrument, a bassist grappling an instrument bigger than he is – Mingus Ah Um is alive with personality. Young’s sixth studio album was recorded mostly in August 1973, but its release was delayed for almost two years (perhaps because, in the words of producer David Briggs, “it is a handful. It is unrelenting. There is no relief in it at all. It does not release you for one second”). A long way from the public’s perception of Young at the time as a vaguely hippified, vaguely countrified vendor of superior balladry, Tonight’s The Night is a sloppy, stoned, anguished howl of grief and loss. The late-90s heavyweight-vinyl reissue of Tonight’s The Night is one of the most effortlessly revealing records you’ll hear. Every greasy finger-squeak, every exhausted bum note in the vocal, every zizzle of the snare beneath the drum-skin reacting to low-frequency sound is delivered with staggering immediacy. The interaction between musicians (this is predominantly an ‘as-live’ recording) is made plain, and there’s real corporeality – especially to the bottom end. The timbre and texture of instruments is entirely convincing. And where resigned, wretched world-weariness is concerned you’ll never hear a more eloquent recording. All of the elements were in place for Heart of the Congos to be a singular record: three vocalists with supernatural harmonic sympathy, a top-of-the-line band including Sly Dunbar, Ernest Ranglin and Boris Gardiner, and a collection of strong, politically and religiously charged songs. Plus, of course, production by Lee ‘Scratch’ Perry at his Black Ark studio. It’s the production that elevates Heart of the Congos from a superior roots reggae album to a peerless and unique recording. Absolutely drenched in reverb, endlessly echoing and repeating, with the most extraordinary noises punctuating proceedings (“what is that sound? Is that… is that cattle?”), it’s a sonic signature that’s unlike anything else you’ve heard. And even at its most conventional, Heart of the Congos is a warm, rhythmically engaging and thrillingly performed record. Brian Eno already had plenty of previous where ambient music is concerned by the time he was commissioned to score a documentary movie called For All Mankind. In the end the film was left in limbo until 1989, by which time Eno’s putative soundtrack had created its own critical traction. For a recording during which not much happens, and what does happen occurs at a leisurely and refined pace, Apollo: Atmospheres & Soundtracks is a much more varied album than some of Eno’s earlier ambient work. There are the trademark texture pieces, of course, but also some smoother and more accessible moments. And there are some moments of shining weightlessness delivered by Daniel Lanois’s superlative steel guitar. Drop a copy of this onto a system capable of revealing the ‘soft’ attacks produced by playing notes backwards with multiple effects, and prepare for a nice, calming blast-off. Unless you’d paid close attention, Talk Talk’s place in the public consciousness as a pop group – a sort of unsexy Duran Duran – seemed pretty reasonable. Some of those singles were damn catchy, after all. But Spirit of Eden, the band’s fourth album, is about as far from chart-friendly pop as it gets. If you want to know where the idea of post-rock gained traction, give this a spin. Moody and sprawling, Spirit of Eden resulted from assembling a sizable number of disparate musicians and then editing down from their many hours of improvised performances. The resulting amalgam of jazz, rock, chamber and ambient music sounds stunning on a well-sorted vinyl system. Hugely dynamic (Spirit of Eden at times runs from virtual silence to full-on orchestral overload and back again in an instant), alive with tiny details and with a sweeping unity to its more grandiose passages, it’s a huge test of timing and soundstaging. The second and final album by the trio called PJ Harvey (before Polly Jean did the obvious thing and went it truly alone) doesn't have much by way of light and shade - it's a peculiarly one-note recording. But, good heavens, it's as immediate and confrontational a recording as has ever been committed to vinyl. 'Recorded' (he mistrusts the description 'produced') by the notoriously single-minded Steve Albini - he'd already put his open-wound stamp on records by Pixies and Slint, among others - it's a staggeringly direct-sounding LP. Harvey's songs of psychosis and separation suit Albini's sound down to the ground - the levels of attack and aggression he brings, especially to the drumkit, will test any vinyl set-up to the limit. It's his work on Rid Of Me that landed Albini the gig to record Nirvana's In Utero. Altogether darker and more oppressive than Massive Attack’s previous two albums, Mezzanine is the sound of a band at war with itself, only periodically rising above the surface for air. Aside from some peerless arrangements and one gold-plated classic (Teardrop), Mezzanine is notable as one of the first times a major act made an album available for download before its physical release. On vinyl, Mezzanine is an implacable recording; one that packs iron-fisted punch from a widescreen stage. Where scale, dynamics and earth-moving low-end attack is concerned, it’s among the most testing albums around. And the way the vocals (from the likes of Horace Andy and Elizabeth Fraser, who are about as emotive as they come) are recorded make Mezzanine a hugely affecting album when delivered by the right system. There’s more to Radiohead’s seventh studio album than artistic merit - it would be difficult to overestimate how In Rainbows’ pay-what-you-like digital release, a couple of months before any physical copies made their way onto the shelves, changed the way major artists and labels thought about releasing music - but it remains a great, challenging piece of music. Much of our love for this album as a test disc is down to its opening track, 15 Step, a glorious concoction of live and electronic instruments and glitches comprising some of the most delightfully complex rhythms. In our review of ProAc's Studio 118 speakers, we said: “In the wrong hands this track’s polyrhythm can sound like an injured crab tripping over a boiled sweet wrapper.” See what your system can make of that. If you’re going to get Nile Rogers in, then a compressed and radio-friendly recording is never going to cut it. For their fourth album, Daft Punk took you definitively back to the day when Studio 54 ruled and when Rogers was a superstar for the very first time. Painstakingly recorded and featuring a stellar cast of performers (when you can put J.R. Robinson and Omar Hakim on the drum-stool you know nothing can go wrong), Random Access Memories is most definitely a hi-fi recording. Wide-open, punchy and dynamic, with ample breathing-space and each guest vocalist given plenty of elbow-room, Random Access Memories is painstakingly produced and high-gloss. Expect it to feature at hi-fi shows for the next 20 years. On the occasion of his 80th birthday, Leonard Cohen – songwriter, musician, poet, novelist, monk, lover and defraudee – released the 13th studio album of a six decade-long career. And not only did it prove Cohen still had plenty left in the tank, it contained some of his strongest, most vivid songwriting in years. Singing like a man who has fully inhabited every one of his years, and with the gravitas and authority of a prophet aware of his own flaws, Cohen lays it on thick and chewy: “…there’s torture, and there’s killing, and there’s all my bad reviews…” he sings on Almost Like the Blues. The sound of the album is every bit as painstaking as the writing. Lushly organic, with the emphasis on piano, organ and stand-up bass with periodic string- or horn-stabs for temperature and punctuation, it’s custom-made for vinyl’s acknowledged mastery of instrumental timbre and texture. The usual female chorus is on hand to counterpoint Cohen’s subterranean rumble of a voice, and the entire package is the very definition of good taste. With each album - this is the band's fourth - GoGo Penguin have moved further away from the fairly straight-ahead jazz they initially dealt in, and navigated confidently into the rarely charted waters between electronica, jazz and classical music. And quite aside from the virtuosity on display here (the trio of drums, keyboards and bass are capable of whipping up a buffeting storm just as readily as lulling you with a wonky lullaby), this is the band's second album for the legendary Blue Note label - and Blue Note has certain standards and a certain reputation to maintain. Consequently A Humdrum Star is an exquisitely recorded album, more than capable of putting your system through its paces. Attack and decay, dynamism, texture and tonality all come under the microscope - and once the analysis is over, you're left with an album that reveals a little more of itself with every listen.